Private inspector Steve Paul says he told the Missouri duck-boat company about design flaws in their boats that increase risks in a sinking scenario—like the boats' canopies, CBS News reports. "That canopy becomes what I'll call a people catcher, and people can't get out from under that canopy," says Paul. Another risk: In rough weather, water can get into the exhaust and stop the motor, disabling its pump from getting water out of the hull. "If you watch that video, that water is definitely being slammed up into that exhaust without a doubt," says Paul. He gave the duck-boat company a report in 2017, but wouldn't share it with reporters. "I'm sure eventually it will be subpoenaed," he says. "I said, 'Lord, please, I've got to get to my babies. 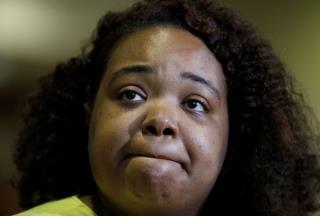 I've got to get to my babies," Tia Coleman said through tears at a news conference in Branson on Saturday, per CNN. But Coleman—who lost three children, her husband, and five other family members in the sinking—said none were wearing life jackets because the captain deemed them unnecessary. "I felt like, if I was able to get a life jacket I could have saved my babies because they could have at least floated up to the top and somebody could have grabbed them. And I wasn't able to do that." She bumped her head trying to leave the boat, possibly against the canopy, and let herself float as she gave up hope—but floated all the way to the surface. "God must have something for me because there's no way I should be here." No one's ridiculous comment about not needing life vests when you have 3 small children should ever prevent the common sense of using them 100% of the time when drowning, however unlikely, is a possible outcome. Parents are obligated to ensure the safety of their kids. Ride the Ducks should have their business licenses revoked and they should be shut down. How many people have to die before they're forced to close? people are so hung up on regulations. why do we need the government to keep us safe?